The final few sticker-paintings forming part of the installation Solo I Bambini Ci Salveranno were affixed by schoolchildren this morning during the festival opening at Pjazza de Valette. 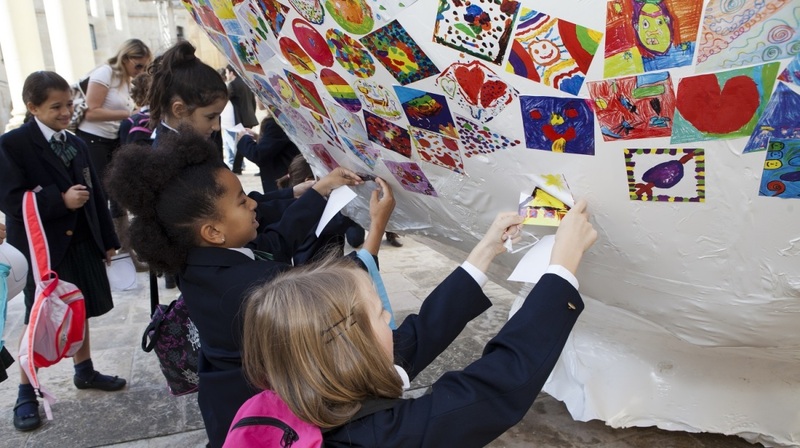 Work on the installation, by artist Austin Camilleri, had been ongoing for a number of weeks and involved the drawing of paintings by 12,000 primary schoolchildren in Malta and Gozo. Each painting was subsequently individually digitized, printed and integrated in a public installation, bringing children’s voices to the centre of Valletta. The project forms part of the Valletta 2018 Cultural Programme and is supported by the Valletta 2018 Foundation. Culture Minister Owen Bonnici, together with a number of representatives from cultural entities, was also led for a walk through St James Cavalier, where a number of productions were ongoing as part of the festival. Running until Sunday 23 November, the festival will feature an amazing 28 productions, including 12 foreign shows from seven different countries. Artists from Spain, France, Germany, Italy and the Netherlands among others have teamed up with some of the best Maltese artists to create the only festival in Malta where children and young people are truly centre stage. With over 132 events in a week-long programme, the festival reaches audience figures of up to 12,000, half of which come from schools. From music to dance, from the visual arts to puppetry, and from mime to shadow theatre, children are immersed in a set of parallel worlds where dreams and memories, forests and gardens, fairytale and reality come together to tell gripping storylines which children will relate to. Children will form part of or be able to join in some of the shows. This year’s theme revolves around identity, a notion which runs loosely through most of the productions, aiming to help children explore notions of who they are and want to become. These are explored with great sensitivity and imagination by artists such as Trevor Zahra, Austin Camilleri, Simone Spiteri, Ruben Zahra and Vince Briffa as well as a number of upcoming artists. Żigużajg Festival prides itself on a programme which features participating artists of a very high calibre, and who are well-known for a number of productions both locally as well as internationally. Each year’s programme is put together with great attention given to delivery, genre, relevance to age groups and, above all, excellence. ŻiguŻajg is produced by St James Cavalier Centre for Creativity with the support of Fondazzjoni Ċelebrazzjonijiet Nazzjonali and the Government of Malta. Sponsors are the Mackintosh Foundation, MSV Life, the German Embassy in Valletta, Valletta 2018 Foundation, Wasteserv and Pillow Spaceframe Ltd as well as the Austrian Embassy, the Spanish Embassy, Malta Airport Shopping, Actavis and Pampers. For more information visit the ŻiguŻajg website and Facebook page.